Hand scraping hardwood floors is the same as distressing them. It is a method making hardwood floors look older than they actually are. With a rustic charm, it gives floors a naturally worn appearance that is perfect for an active family. Distressed floors are easier to maintain in that a nick or ding in the floor isn't a big deal, it merely adds more character. This look can easily be attained without having to pay installers to do it and can save your pocketbook from costly updates by doing it yourself. Use a floor sander to sand the entire floor. Use a 38-grit disc and switch to a 60-grit disc. Use a 6-inch spinner/edger to get the leftover stain near the edges. Vacuum thoroughly to remove all dust and debris. Wet a small area of the floor and scrape the area with a scraper. Move around the floor wetting and scraping small areas at a time. Scrape against the grain of the wood to give it a worn look. Sweep or vacuum away all of the shavings. Hit the floor in random places with the length of a metal chain to leave as many desired dents. Use a paint scraper on the floor in a slicing motion to leave random scratches on the floor. Gouge the floor in random places with a crowbar. Lightly buff the floor with a buffer once all the gouges and marks are in place. Apply the first coat of stain with a brush or paint roller. Apply the second coat of stain after 12 hours. Make sure all dust and debris is removed from the floor before staining. 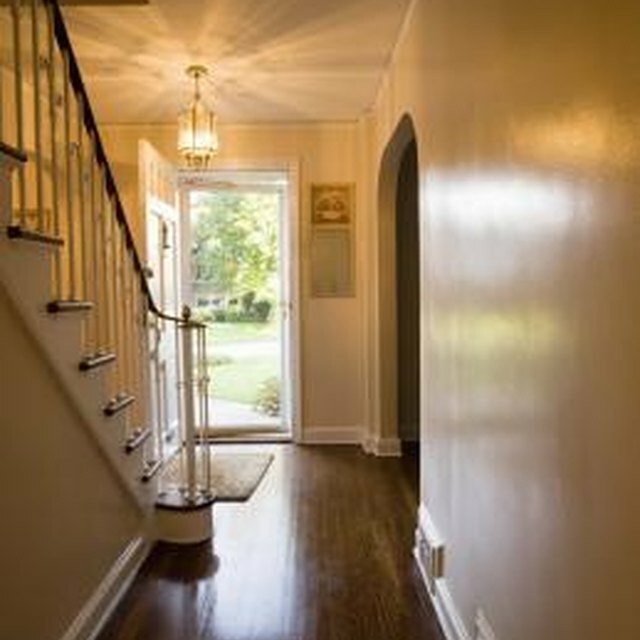 Ventilate the area well while staining the floors to avoid harmful fumes. Wear protective clothing and glasses to avoid getting debris in the eyes and on the body.